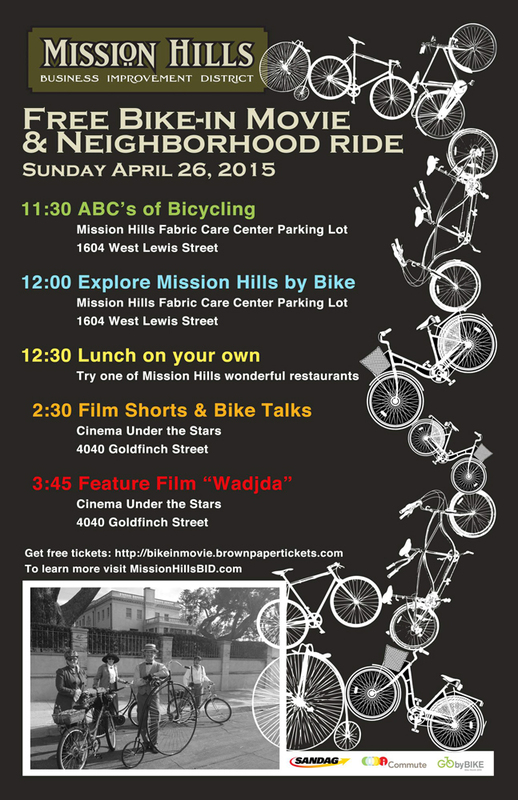 The Mission Hills Business Improvement District, through a generous grant from SANDAG, iCommute, & GO by BIKE, is hosting the Mission Hills Free Bike-In Movie Night & Neighborhood Ride on April 26, 2015. This will be a fun event for people of all ages to explore Mission Hills by bike and then enjoy some bike-themed talks and films right here in Mission Hills. The event is completely free to participants, however, due to space restrictions, those participants wishing to join us at the theatre portion of the event will need to claim a free ticket through Brown Paper Tickets. Q: Are there any age restrictions for participants? A: No, people of all ages are welcome and encouraged to come experience Mission Hills, by bike! Q: May I still participate if I do not have a ticket for the event? A: Yes, people of all ages may participate and join us or leave at anytime throughout the scheduled event. The ticket is only required for those participants who wish to listen to the bike talks and/or watch the films. This is due to the limited amount of space for viewing the films. Q: What will the bike route be? A: Maps will be distributed at the 11:30AM ABC’s portion of the event (See Schedule of Event below). The maps will identify the bike route(s) participants will be encouraged to take. A: Water stations will be identified on the map. Participants are encouraged to bring their own water as they would on any other bike ride. In addition, Mission Hills has many food and beverage establishments so this will be a great way to try some place you have not before! Q: Are any of the local Mission Hills businesses holding ‘specials’ for Bike-In participants? A: Venues offering special things for those participating in the Mission Hills Free Bike-In Movie Night & Neighborhood Ride will be on the map and/or have special coupons available to hand out at one of the events during the course of the day. Meet at Mission Hills Fabric Care Center parking lot. Leave Mission Hills Fabric Care Center parking lot to explore. Try one of Mission Hills wonderful restaurants.